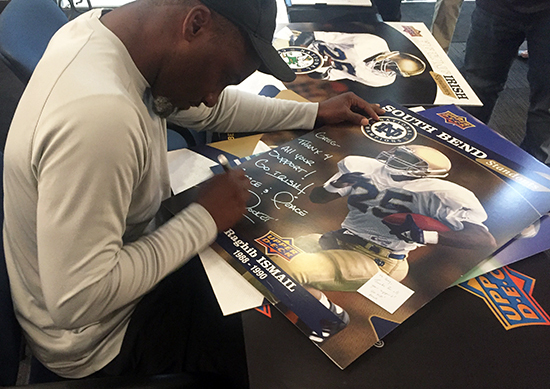 Earlier this summer Upper Deck hosted Raghib “The Rocket” Ismail at corporate headquarters to sign autographs for the new Notre Dame 1988 Champions Football set which releases tomorrow on the patent-pending Upper Deck e-Pack™ platform. 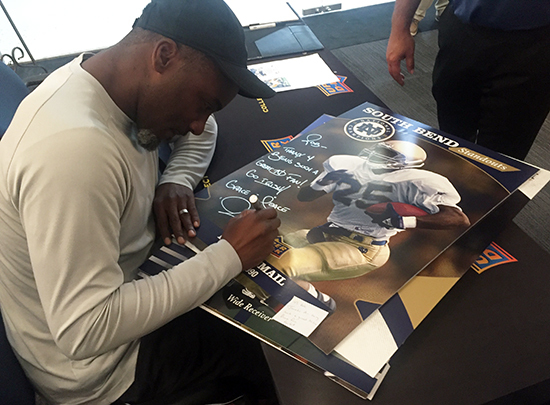 We had Ismail sign a few other autographs on larger-than-life blow-up cards to use to surprise some Notre Dame super fans on our radar. 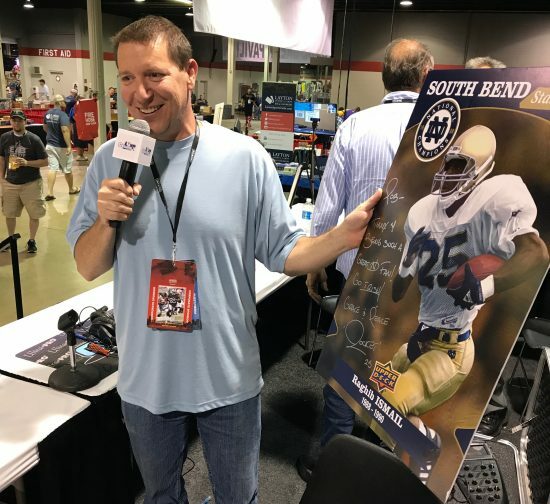 The first up was Rob Bertrand who serves as “The Voice of the Collector” and who is a huge ND fan. 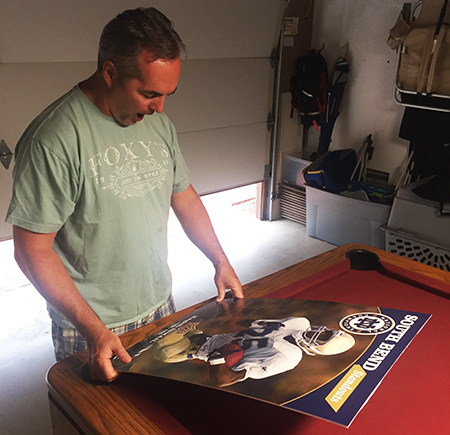 We caught him at the National Sports Collectors Convention and needless to say, he was very pleased with the surprise. Rocket signed the piece to Rob thanking him for his support. Rob was very surprised and excited to score this personalized collectible! Here’s a look at Ismail signing the piece. From what we heard last from his wife, he is still standing staring at the piece like this. It’s incredible the passion that Notre Dame fans have for their football team. The 1988 team is especially important to the fan base and this new set from Upper Deck should be a huge draw. 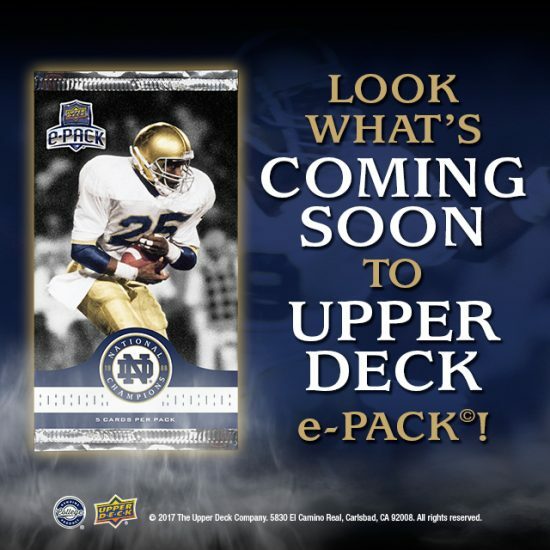 What makes it especially compelling is that by using e-Pack to deliver this product, fans will be able to store the cards with Upper Deck, trade them with fans around the world and take ownership of the physical cards should they wish. There are also a variety of achievement cards available to those who wish to put together all the different sets in the product. Full details will be announced tomorrow at UpperDeckePack.com, but this is a product that will certainly have the Irish eyes smiling.